Halloween is over and the ghosts and ghouls have been chased away for another year. Back to the regular bloon popping fun! Bloons TD 5 Stickers are now available exclusively on iOS 10! Whatever your message, say it with bloons! Find them in iMessage now! 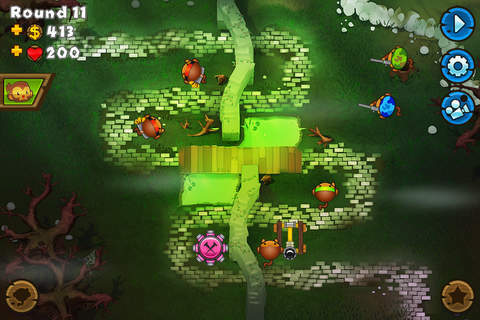 Five-star tower defense with unrivaled depth and replayability. Check out the all new Quest system! I think that we need more towers it would be so cool if there were more towers to use. It’s a fun game don’t get me wrong, but recently the game has been very sluggish. Especially during the final rounds. It gets so bad that it freezes the screen and doesn’t allow me to add more towers or anything. I feel like the people who make the game are doing this on purpose to get me to make a in app purchase. My reasoning for that is because this has never happened to me before. And I had this game for a few months now. I’m losing now just because of this. Hard to move forward in this game with the lagging. Please fix. Been playing the series for far longer still. Great, unique, inventive. A fantastic game for TD veterans and noobs alike!! The theme is fun and a little silly, but doesn’t stop you from getting competitive, and into it. GET IT. Now, I have a serious complaint. My save file, and thousands of others was lost. The game even acknowledges my high score on levels, but all my time collecting money and leveling up towers is gone. Had to start at level 1.. The loss of full game center integration was not handled well. Overall B+ Anyone can pick this up and enjoy. Enough content to keep you busy for untold amounts of hours. Micro transactions are sloppy and not very helpful. Okay so i love everything about this game, everything is absolutely perfect but i often play alot of multiplayer in this game to play with my girlfriend because i dont get to see her often. She has “okay” but not great internet connection. So when we play together she always immediately disconnects. I was wondering if maybe, if the developers even see this, if they would update the multiplayer to the point where it will stop the game to atleast give people with bad internet a chance to reconnect again. This problem is annoying because we everytime we go to around 50 or so the internet craps out for one second and it disconnects. Thank you so much for reading this and i hope to see some sort of improvement soon. Simply amazing game and quite an incredible ammount of fun, diversity and challenge that make this game so awesome and you never lose the interest to play it. Just one detail : when you produce bananas, you need to avoid them falling near buttons, it's quite annoying to click a banana and activate some option by accident. Anyways, my favorite mobile game so far, definitely recommend it to everyone as a MUST HAVE!!! Okay, I have a hard time saying how good your game is, but Love it soooooooo much! Very good and It never gets old. 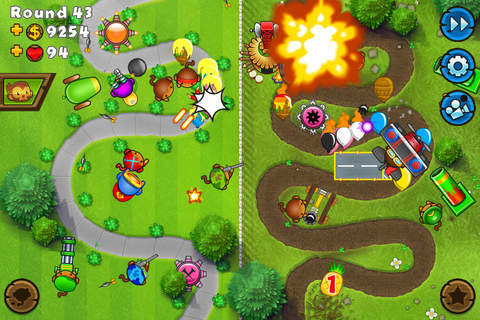 I have one recommendation; Please add a tank monkey, Maybe it could be like the helicopter, And it has many modes like, Follow touch, and what not. Ok I lied, one more thing. Maybe add a "Gambler Monkey" that attacks with dice. Upgrades would go, Top: Extra range, Harder dice, Loaded dice, and than some weird "Good probability upgrade that makes it a 50% Chance he gambles a big win. On the bottom upgrades: More money (more money per win), Sniper dice, Super fire, And than a "Pool Master" Which causes it to throw a big pool stick and as an ability it throws a casino machine. Also I forgot to mention this earlier, He gambles on each throw of the dice, and if he wins, he gets 70 maybe 80 in game cash and if he loses, you lose $50. This is an idea my friend came up with and it would be really cool if you could make it work. I love all your hard work, and I really appreciate it.